What is it with these people? They have the word ethical in their name and yet they behave like this. Again and again. Coercion using stress, or coercion using the fear of consequences is BULLYING. At last someone has given them a slap on the wrist: The Advertising Standards Agency have called a halt to their latest bout of scaremongering where they refer to a number of diseases, two of which were known to have originated from eating contaminated meat and two that did not. 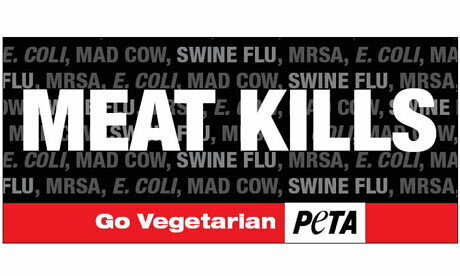 "Although we understood the intention was to refer to livestock and meat production rather than just eating meat, we considered that the message was, at best, ambiguous," ...."We considered that some readers might infer from the poster, and in particular the claim "Meat kills" in conjunction with the claim "Go vegetarian", that eating meat caused swine flu. We concluded that the poster was likely to mislead and could cause undue fear and distress to some readers." Notice how the words 'swine flu' are highlighted to be the first words the reader sees after the headline? What was ethical about that? Dear PETA supporter reading this, please consider this question. If you have to lie to convince others of the rightness of your cause, maybe your cause is dishonest? Just a thought.